If you like to roam, Wyoming is the place to be. With jaw-dropping scenery and over 18 million acres of public land, the Cowboy State is a haven for hikers, campers, skiers, horseback riders, and other outdoor enthusiasts. That said, if you’d rather stay closer to home, Wyoming is also a decent place to own a backyard swimming pool. For residents of Cheyenne, Casper, and other places, a few months of swimming in the summer is the perfect way to round out all the recreational activities the state has to offer. In most parts of Wyoming, the summers are warm and dry, making for some fine swimming weather. In Gillette, for example, a typical day in July or August offers a high temperature in the 80s. You can expand the swimming season further by installing a pool heater, with the understanding that you’ll have to pay extra to keep the water comfortable as the air temperature drops. When considering extras for a swimming pool in Wyoming, the first thing that comes to mind is an automatic pool cover. Come to think of it, this feature makes so much sense that it’s hardly even an “extra.” It’s closer to a “must-have.” With cooler air temperatures (especially at night) and high winds in many parts of Wyoming, an automatic pool cover will likely pay for itself in short order by reducing pool heating costs. If you’re looking for a true luxury, an infinity edge (aka negative or vanishing edge) pool is one option. These beautiful pools blend right into the horizon thanks to an optical illusion created by a “weir wall” on one side. They aren’t for everyone, but if you have extra cash and access to some of that jaw-dropping scenery we mentioned earlier, this could be the way to go. Construction labor costs in Wyoming are around the national average, so you might expect your project to fall into the typical range for inground pool installation. Of course, with all the cost variables involved in building a pool, you can easily fall outside of that (already wide) range. 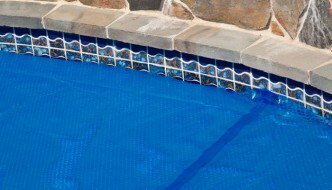 To keep your cost lower, you might want to consider a basic pool with a vinyl liner – especially if you expect to only use the pool for a few months a year. You might even be able to install such a pool yourself with the help of a pool kit and/or minimal help from contractors. You can save a lot of money this way, but of course there are also many perils with the “do it yourself” approach. Like any other major home improvement project, pool installation in Wyoming requires a permit from your city or county building department. The process varies from place to place, but one thing’s for certain – you’ll need to have your application submitted and approved before work can begin. You’ll likely also have to pay a fee based on some standard formula (in Laramie, for example, it’s based on the valuation of the work being done). All this is just to give you an idea of what might be required. You or your pool contractor need to understand the requirements that apply where you live. Safety laws are also a local matter. You or your builder should research the laws in your city or county to find out whether you need a pool fence or other safety equipment. Keep in mind that the laws for public and private swimming pools are completely different. Regardless of what the law requires, it’s always smart to review your own situation and do whatever it takes to make your pool as safe as possible. Infinity Edge Pools: Cost is One Big "Negative"